This article is about the inlet of the Barents Sea. For White Sea in Turkish, see Mediterranean. For the part of the Mediterranean called White Sea in some South Slavic languages, see Aegean Sea. For the American solo music project, see Morgan Kibby. 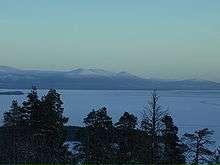 The White Sea is a water-filled depression in the block of a continental shelf known as the Baltic Shield. 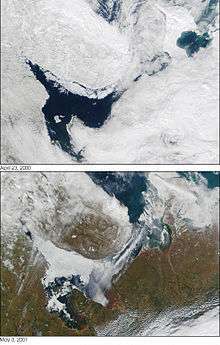 Its bottom is very uneven and contains the Kandalaksha Hollow in the northwest and the Solovetsky Islands in the south. Also, the Onega Bay has many small underwater elevations. The opening and the gorlo of the sea are rather shallow, with the depths about 50 metres or less. In addition, there is an underwater ridge in the northern part of the gorlo, resulting in maximum depths of 40 metres in that part. This hinders water exchange between the White and Barents seas. The exchange is however assisted by the tides, which are semidiurnal (rising twice a day), with the amplitude increasing from 1 metre on the south to 10 metres in Mezen Bay. Currents are rather weak in the open seas with the speed below 1 km/h, but they significantly strengthen in the bays. The tidal waves are much faster than the regular currents and reach the speeds of 9 km/h in Mezen Bay, 3.6 km/h in Onega Bay and 1.3 km/h in the Kandalaksha Gulf. The sea was known to the Novgorod people since at least the 11th century and was rapidly explored because of its commercial significance for navigation and coastal forests rich in fur animals. One of the earliest settlements near the sea shores was established in the late 14th century in Kholmogory, on the Northern Dvina River. From there, in 1492, a merchant fleet laden with grain and carrying ambassadors of Ivan III of Russia sailed to Denmark, marking the establishment of the first international seaport in Russia. The first foreign ship to arrive in Kholmogory was the English Edward Bonaventure commanded by Richard Chancellor. Together with two other ships under the command of Hugh Willoughby, they were seeking a northern route to the Indies, especially India and China. The expedition was sponsored by King Edward VI and a group of about 240 English merchants and was authorised to establish trade connections. The ships of Willoughby were separated and the other two were lost at sea, but Edward Bonaventure managed to pass the White Sea and reach Kholmogory, from where Chancellor was escorted to Moscow to meet the Russian Tsar, Ivan the Terrible. 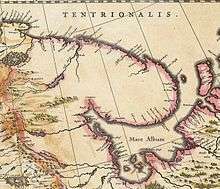 Returning from Russia in 1554, Chancellor brought a detailed description of Moscow and the Russian north, which were largely unknown to Europe, as well as a letter from the Tsar expressing desire to establish trade relations with England. In 1555, Queen Mary issued a charter authorising the Muscovy Company to trade with Russia via the White Sea route. The English ships were soon followed by Dutch, and the port of Kholmogory became busy with shipments of fur and fish. Local and foreign shops and factories were established in the city at that time. The port was reinforced with a fortress which sustained a siege by the Polish-Lithuanian army in 1613. Increasing traffic was overloading the port, which was standing on shallow river waters and had a limited ship capacity. However, instead of expanding the old port, a new one, called New Kholmogory, was founded on the sea shores in 1584 and later became the city of Arkhangelsk. Between the 15th and early 18th centuries, the White Sea provided the major trade route to Russia. This role decreased later with the foundation of Saint Petersburg, which opened a more favorable connection via the Baltic Sea. From the 1920s, most Russian sea shipments were diverted from the White Sea to the new port of Murmansk, where the waters did not freeze in winter. There is belief that in the spring of 1940 some of the 10,000 unaccounted Polish military personnel were towed out to the White Sea in barges and deliberately sunk by the NKVD. The bodies of more than 4,000 Polish officers, noncommissioned officers, police and other personnel detained in the Kozielsk Camp murdered by the NKVD were found in the Katyn Forest, known as the Katyn massacre. However, nearly 10,000 personnel from two other camps, Ostashkow Camp and Starobielsk, were never accounted for. Reports suggest that some of the missing might have been murdered en masse by drowning in the White Sea. The sea hosts more than 700 species of invertebrates, about 60 species of fish, and five species of marine mammals, including friendly beluga, the white whale. Several other dolphin species, such as harbour porpoises, appear less frequently while larger whales are rare visitors to the waters. The fishing industry is relatively small, mostly targeting harp seal, ringed seal, herring, saffron cod, European smelt, Atlantic cod and Atlantic salmon. There is a developing seaweed industry. The White Sea is an important traffic centre of northwestern Russia, interconnecting various economic regions and providing an outlet to the foreign routes. The White Sea – Baltic Canal links it through Onega Lake to the Baltic Sea and the major city and port of Saint Petersburg. 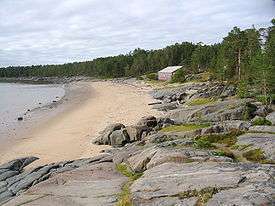 The Baltic Sea, in turn, is connected by the Volga–Baltic Waterway to the Volga River, Black, Caspian, and Azov seas. The major ports on the White Sea are Arkhangelsk, Belomorsk, Onega, Mezen, Kem, Kandalaksha and Umba. Despite being frozen in winter, the sea remains navigable all year around because of deployment of icebreakers. "White Sea". Collier's New Encyclopedia. 1921.